Be the first to share your favorite memory, photo or story of Fredia. This memorial page is dedicated for family, friends and future generations to celebrate the life of their loved one. 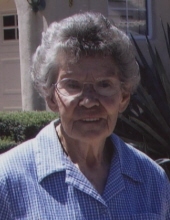 Fredia I. Atkins, age 93, of Birdseye, passed away at 11:44 a.m., on Monday, January 28, 2019, at her residence. She was born February 21, 1925, in Eckerty, Indiana to John Thomas and Grace (Williams) Riley; and married Otto Atkins in 1946, in Indianapolis. Fredia was a member of the Birdseye Christian Church. She enjoyed baking and going on walks. Fredia was preceded in death by her husband, Otto Atkins, on August 18, 1998; two children, Kenny Atkins and Beverly Morgan; and four siblings, Walter Riley, Carl Riley, Lorrene Atkins and Wilma Jones. She is survived by one daughter, Janice Atkins of Birdseye; one sister, Goldie Jones of Plainfield; by (5) grandchildren and (4) great grandchildren. Funeral services for Fredia Atkins will be held at 1:00 p.m., on February 6th, 2019, Wednesday, at the Nass & Son Funeral Home in Huntingburg with burial to follow at Mentor Cemetery near Birdseye. "Email Address" would like to share the life celebration of Fredia I. Atkins. Click on the "link" to go to share a favorite memory or leave a condolence message for the family.